Spectral methods in GCMs - and some thoughts on CFD. There has been a lot of discussion recently on the maths of GCMs. I have summarised some in a series on chaos and the Lorenz equations (here, here, and here). David Young has commented substiantally on this thread, and raised the issue of the use of spectral methods in GCMs. These are used in the dynamical core, which relates pressure and velocity via the Navier-Stokes equations. They are time critical, because they require resolving sound waves, and so the speed performance here fixes that of the code as a whole. Spectral methods are used because they are fast. But some mystery is made of them, which I would like to try to dispel. But I'd like to do this in the context of some simplifying observations about CFD. Hansen's famous 1988 paper used runs of an early GISS GCM to forecast temperatures for the next thirty years. These forecasts are now often checked against observations. I wrote about them here. That post had an active plotter which allowed you to superimpose various observation data on Hansen's original model results. I did an update in 2015 here, and a lot of text from there is repeated here.. I think Hansen's projections had stood up well, but they ran ahead of warming during the "pause" of around 2006-13. That pause is now over, so the interest is in whether Hansen's projection is still running warm. I've updated to Oct 2016, or latest available. Hansen's original plot matched to GISS Ts (met stations only), and used a baseline of 1951-80. I have used that base where possible, but for the satellite measures UAH and RSS I have matched to GISS Ts (Hansen's original index) in the 1981-2010 mean. But there is also a text window where you can enter your own offset if you have some other idea. A reminder that Hansen did his calculations subject to three scenarios, A,B,C. GCM models do not predict the future of GHG gas levels, etc - that must be supplied as input. People like to argue about what these scenarios meant, and which is to be preferred. The only test that matters is what actually occurred. And the test of that are the actual GHG concentrations that he used, relative to what we now measure. The actual numbers are in files here. Scenario A, highest emissions, has 410 ppm in 2015. Scen B has 406, and Scen C has 369.5. The differences between A and B mainly lie elsewhere - B allowed for a volcano (much like Pinatubo), and of course there are other gases, including CFC's, which were still being emitted in 1988, but not much now. Measured CO2 fell a little short of Scenarios A and B, and methane fell quite a lot short, as did CFCs. So overall, the actual scenario that unfolded was between B and C.
Remember, Hansen was not just predicting for the 2010-16 period. 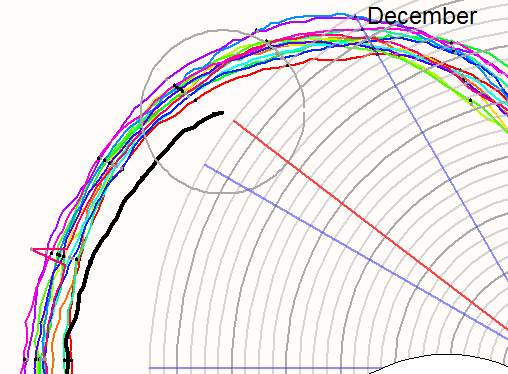 In fact, his GISS Ts index tracked Scenario B quite well untill 2010, then his model warmed while the Earth didn't. But then the model stabilised while lately the Earth has warmed, so once again the Scenario B projections are close. Since the projections actually cool now to 2017, surface air observation series for now are warmer than Scen B (Giss). GISS Ts corresponds to the actual air measure that his model provided. Land/ocean indices include SST, which was not the practice in 1988. Hansen himself has expressed the view that the right measure of his projection now lies between Ts and Ts+SST. So in the graphic below, you can choose with radio buttons which indices to plot. You can enter a prior offset if you wish. It's hard to erase on a HTML canvas, so there is a clear all button to let you start again. The data is annual average; 2016 is average to date. You can check the earlier post for more detail. Chemistry of sequestration and carbon cycles. There has been some recent discussion of carbon cycles. ATTP had a good series on ocean CO₂ uptake here. And in the context of sequestration, WUWT reported on some recent experiments with sequestering CO₂ in basic basalt rocks. The discussion showed that there is a lot people don't understand about the basic chemistry driving the carbon cycle, which this chemical sequestration tries to exploit. There is a finite amount of carbon in short term exchange with the atmosphere; it passes through forms where it is reduced by photosynthesis, and re-oxidised quite quickly, as it must be by the ubiquity of oxygen. And there is constant exchange with the upper layers of the ocean. Over millions of years, the amount of such carbon varied, reflected in atmospheric ppm. Carbonate rocks are unstable to heat; CO₂ is emitted by molten rock, most obviously appearing in volcanic eruptions. This would lead to indefinite accumulation, were it not for a process where basic rocks are weathered, exposing surfaces which can convert the CO₂ back to carbonate. This leads to a kind of balance. Humans are disrupting this by digging and oxidising many gigatons of reduced carbon. The energy that enabled this reduction came from millions of years of photosynthesis and deposition, which prevented re-oxidation. Our burning is running far ahead of the long cycle, so the idea of the basalt absorption is accelerated weathering, probably through fracking etc. I have no strong views on whether this is feasible, but I'd like to talk about the driving chemiatry. GISS down just 0.01°C in October. GISS is down from 0.90°C in September to 0.89°C in October. As with the similar small drop in TempLS mesh, the main news is that for the first time in a year, it didn't set a record for the month (because Oct 2015 was so warm). As many have remarked, it fits with the near certainty of a record hot 2016. Other indices were down; NCEP/NCAR by 0.056°C. As often recently, polar variations played a big part; both poles were quite warm, and GISS and TempLS mesh respond to this. I expect NOAA and HADCRUT will show larger reductions. 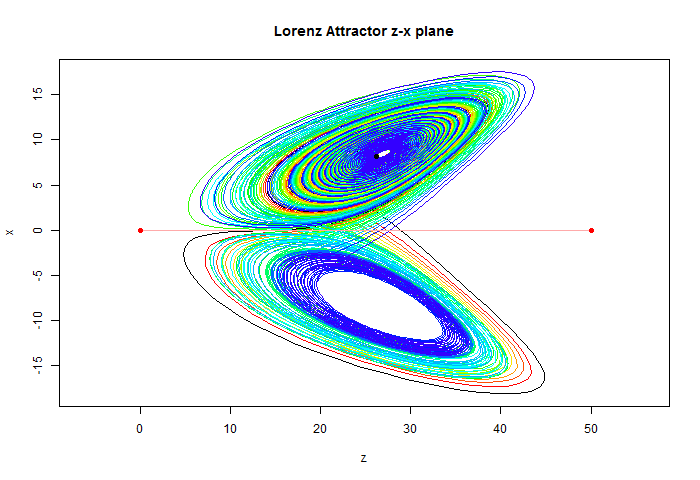 Lorenz attractors, fluids, chaos and climate. 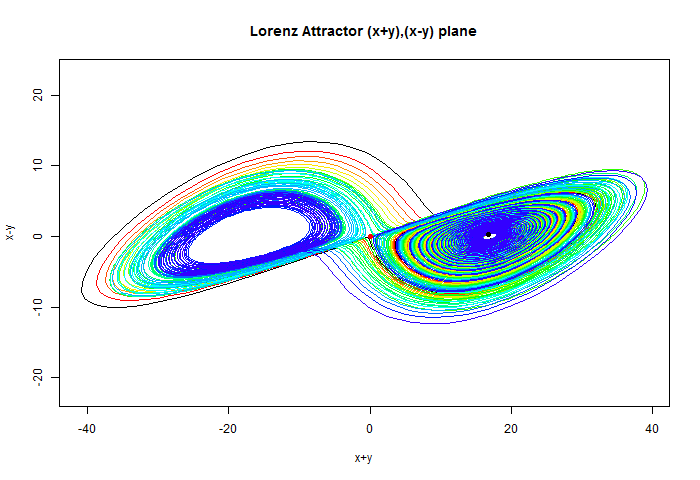 I have written two posts (here and here) on chaos, fluid dynamics and the Lorenz attractor. The context is a series of articles (eg here) which continue a common belief encountered that there is something basically wrong with climate models because they solve Navier-Stokes equations that are inherently chaotic, because of their non-linearity. Chaos is an inappropriately pejorative word here. Computational Fluid Dynamics (CFD) has been dealing with chaos (turbulence) since its beginning about fifty years ago. It is just part of the scene, and actually fits with what we want to know. Chaos is the inability to make solutions correspond to initial conditions. The initial information is lost, and does not recognisably affect the outcome. But that is a plus, because we usually weren't able to measure an initial state anyway. Often it is hard to even say what it would mean, as in flow past an aircraft. The key to this is the existence of attractors. Trajectories wander, but not randomly. 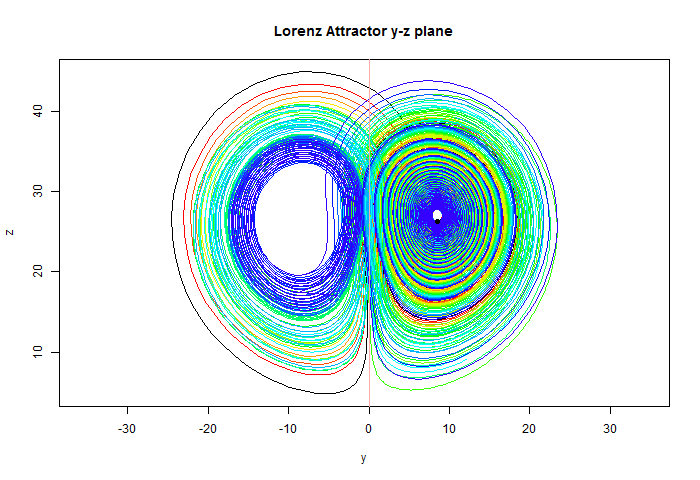 And it is the attractor we want to know about. Weather varies, but climate is the attractor. It is that which attracts people to Miami, not the weather forecast. In my second post, in which I showed a WebGL device for generating and examining (in 3D) the famous Lorenz butterfly chaotic solution, I also showed a Wiki visualisation of an attractor. It was one of several there, but I am now convinced that it is wrong. 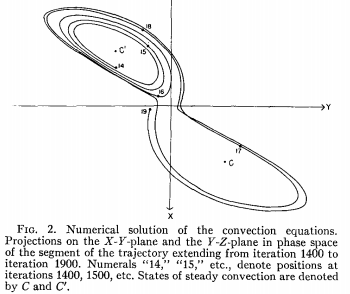 The mathematical papers, from Lorenz on, refer to attractor surfaces. I found this out when trying to calculate attractors myself. 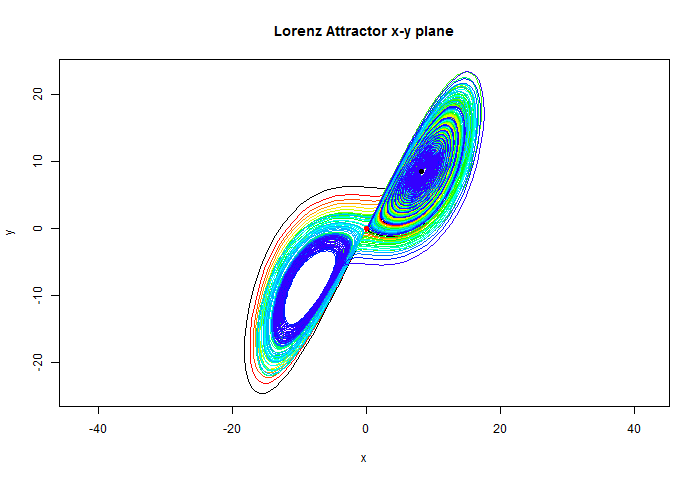 In the process, I found out a lot more about the working of the Lorenz butterfly, and how the attraction works, without making everything just converge to one place. I'll describe that in another post. My purpose is to show that nonlinearity and "chaos" is no cause for despair; at least in this simple case, we can figure out everything we need to know. He used σ=10, β=8/3, ρ=28. Importantly, it is an autonomous (no t on RHS) first-order differential equation. This means that the state (X,Y,Z) at any point entirely determines the following trajectory. Trajectories can't cross, and if they stably follow a surface, then representative values will show it. Regions where trajectories are curved are important, and since the equation is polynomial (quadratic, with well-behaved higher derivatives) fast change of direction is possible only if the first detivatives are small. Zeroes are especially significant, and Lorenz shows two of them - C and C' at the centers of the wings. The third is the origin, which is significant not because it attracts trajectories, but because the z-axis is a trajectory leading to it, which does not stably attract, but is responsible for the transition between the wings. Now it doesn't look so chaotic. 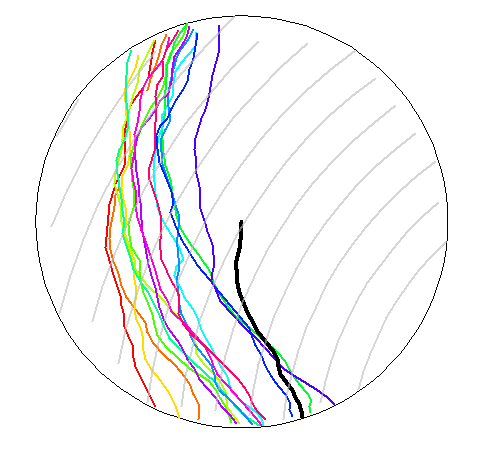 I colored the 16 parallel trajectories near the spiral center (the smaller hole, on the right) with rainbow colors, black marking the red end. You can see that on that wing they evolve with that rainbow band. I have marked the origin with a red dot, and the z-axis with a red line. When the expanding band reached the z-axis, it behaves like a fluid stream meeting a wall. There is a stagnation point, and the lines separate. I chose the original band to ensure that it would not be split here; the trajectories eventually peel off and go into the other half-plane where they are attracted to the other wing. They smoothly merge with it, but at a big spread of points on the evolution of that spiral. So in timing, the trajectories are dramatically separated, but in shape, the surface behaves smoothly. You can see the blue trajectory came closest to the center, and had to wind around many times to emerge. I made the other trajectories wait. Then the whole process was repeated the other way, although no longer in rainbow order. No trajectory is periodic, but the attractor is. That is the important weather/climate analogy. Weather, on times scales up to ENSO and even "pauses" etc, happens in an unpredictable time sequence. My band of trajectories is like an ensemble of GCM solutions. Looked at individually, they are a tangle, but together, they establish a pattern which is not (here) dependent on time, but does depend on the externally imposed parameter values. Of course, we have a WebGL interactive version, below. It doesn't generate the solutions, but you can examine them from angles and restrict time subsets. I'll give details of using it below the jump. TempLS down 0.04°C in October; sea ice is low. The October TempLS mesh index dropped a little from 0.721°C in September to 0.679°C in October. This establishes a new record in recent times - it is the first month since April 2015 that has not been the hottest of that month in the whole record. 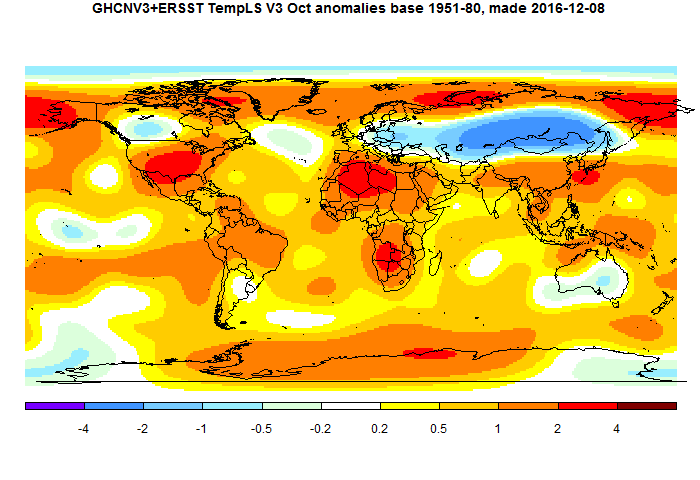 October 2015 was the first really warm month of the El Nino. Canada and Mexico were late reporting this month, so I waited for that. The TempLS grid index showed a greater drop, from 0.734°C to 0.617°C. As usual, this reflects disparity in polar conditions, which remained relatively warm with more cooling elsewhere. Indices like HADCRUT and NOAA may follow this trend. The modest fall in TempLS mesh was very similar to the NCEP/NCAR index, and also UAH lower troposphere. The main map features are a cool band across Siberia, and warmth in the USA. I don't normally post about politics, but I made an exception after the Brexit referendum in June. I wondered then how it would actually be brought to pass. I had optimistically thought that no PM would have the effrontery to try to take Britain out of the EC without parliamentary support - basically invoking Royal privilege. And I had hoped that any PM who tried to do so would lose a vote of confidence and have to resign. I may have been too optimistic - perhaps the battles that were fought for supremacy of parliament really have been forgotten. However, this may be moot. The High Court has now intervened to rule that parliamentary approval to trigger Article 50 is required. So if parliament was too spineless to insist on its prerogative, won't it just roll over and agree? I wonder. The thing is, they will have to approve an actual deal, which may be quite harmful to a lot of their constituents. And members will be rightly held responsible for that. Could be interesting. And there's still the Scotland thing. NCEP/NCAR October down 0.056C - NH sea ice very low.. The Moyhu NCEP/NCAR index dropped a little from 0.475°C in September to 0.419°C in October, neatly reversing the surprising rise from August to Sept. The change mirrors a small drop in UAH V5.6. Last month indices went in various directions, so what this means for this month in other indices is unclear. It is such a remarkable change that a fault might be suspected, but it is the same from both sources. 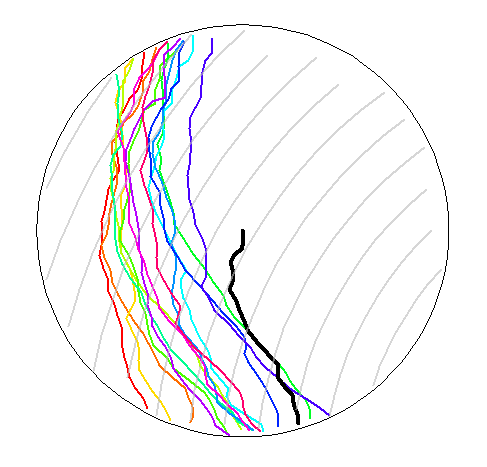 The plot shows a period of about a month, centred on present. The number values are here. Arctic temperatures have been warm.